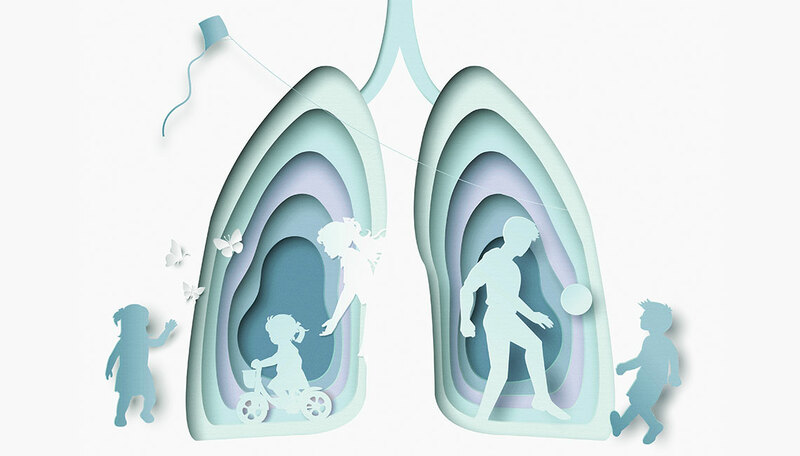 The Pediatric Artificial Lung, developed at C.S. Mott Children’s Hospital, engenders hope for treatment of children with lung failure. On any given day in the pediatric and neonatal ICUs at C.S. Mott Children’s Hospital, there might be one or two children hooked up to pumps and artificial lungs keeping them alive. Here and at all hospitals that treat children with lung failure, the patients are usually bedridden, because of the connection to the machines. Beeps compose the soundtrack to their days; a web of wires forms one of their earliest views. That all could change with new research on implantable, simpler artificial lung systems that can support patients while they play outside or eat dinner at their families’ dining room tables. Ronald Hirschl (M.D. 1983, Residency 1989), the head of pediatric surgery at C.S. Mott Children’s Hospital, and his team at Michigan Medicine are developing the Pediatric Artificial Lung (PAL), which is designed to allow patients experiencing lung failure to go anywhere with a portable, artificial lung on their back. Hirschl’s team of researchers recently received a $2.6 million grant from the National Institutes of Health to develop the PAL and test it for clinical use. It is designed to be implanted and to reside outside of the body, attached to the large blood vessels near the heart and to the heart itself. Development and testing will continue for the next several years. The PAL’s evolution is similar to that of the artificial heart first implanted in 1982. It was hard to imagine 20 years before that time, Hirschl says, that an artificial heart — that could work indefinitely — was possible. Now it has become routine. “We are moving towards developing this so we can do the same thing,” he says of his goal to make the artificial lung just as commonplace. The portable lung could dramatically change the lives of many of the thousands of patients who require support from a device called Extracorporeal Membrane Oxygenation (ECMO). Currently, when pediatric and adult patients experience heart or lung failure, a pump and artificial lung provide support using ECMO, which was developed in the 1970s by U-M surgeon Robert Bartlett (M.D. 1963). The number of patients hooked up to ECMO has skyrocketed over the past decade. In 2005, it was 2,183, while in 2016 it jumped to 9,127, according to the Extracorporeal Life Support Organization. Among the reasons for this is the increase in the number of patients who have contracted H1N1 pneumonia. ECMO uses a pump and an artificial lung to take over the function of the heart or lungs long enough for those organs to recover or ultimately be replaced with a transplant. Patients hooked up to ECMO must stay in the intensive care unit, where they lie in bed, often immobile — sometimes for weeks or months. This can lead to muscle wasting and a swiftly dwindling physical condition that can reduce the ability to survive with or without a lung transplant, Hirschl says. Hirschl adds that years of clinical experience have shown that when patients have been allowed to exercise, they are in better physical condition when they undergo transplantation of other organs, such as a heart. “So we’re doing a similar thing in the setting of lung failure by developing a wearable artificial lung that allows the patient to be mobile,” he says. The PAL, which is about the size of an adult’s hand and is made of hollow fiber membranes, performs the same basic function as ECMO: it adds oxygen to the blood while removing carbon dioxide. Blood flows from the pulmonary artery into the artificial lung, then past the thin, hollow fibers before the blood returns to the left atrium of the heart. Oxygen flows inside of the fibers, which separate the oxygen from the blood, but oxygen and carbon dioxide can still be transferred across the fibers. The right heart — which generates low pressures — is responsible for pumping the blood through the artificial lung. The artificial lung is specially constructed to accommodate these pressures by using low resistance. Michigan Medicine, which has successfully demonstrated the PAL’s efficacy in the laboratory, is one of just a few medical centers developing this type of artificial lung, Hirschl says. His group has been funded to study an implantable artificial lung for the past 15 years. Hirschl says a big advantage with the PAL system is that blood thinners, which currently are required with ECMO and can lead to bleeding complications, may not be required. The team is experimenting with coating the circuits with different types of anticoagulants that would reduce blood clotting. One of the most significant advancements with the PAL is that it allows time for the lung to heal, which may eliminate the need for a lung transplant altogether. Bartlett, an emeritus professor of surgery who has been participating in the project and has been involved in the field of ECMO since 1965, explains that research shows that if you support the lungs with an external system for a prolonged period of time, they can heal and recover back to normal. That is far better than having to endure a transplant, which requires waiting for a donor and then taking immunosuppressant drugs for life and enduring chronic lung problems like pulmonary fibrosis, he says. But he explains that regeneration could take months, so it’s not feasible with the current ECMO system, which forces the patient to remain in the ICU, a complicated and expensive endeavor. He says ECMO is usually turned off after 30 days if the patient doesn’t show improvement by then. “We are aiming to simplify our approach so that we can manage patients out of the ICU and even at home,” he says. Bartlett agrees with Hirschl that the day when a patient could go home with a PAL is roughly five years away. “This device can be part of daily life” until the patient’s lungs improve, Bartlett says. Some challenges remain in the development of the PAL for human use. For example, when patients are active and exercising, they produce more carbon dioxide. A mechanism needs to be developed to increase the amount of carbon dioxide removed by the artificial lung during those times. In addition, monitoring and alarm systems are necessary to notify the patient and doctors when the artificial lung is failing and needs to be changed. Hirschl says that in the early stages of development, it is likely that patients with the lung backpack will begin in the ICU, then will be able to walk around the hospital floor. But the goal is that patients eventually will be able to go home. Implanting it internally could be years or decades down the road, he says. At that point, it will ultimately be wearable.